Importantly, both of these projects provide dispatchable power, to cope with peaks in demand. For years the coal lobby has been trotting out the antiquated mantra that “renewables can’t supply continuous power when the sun don’t shine and the wind don’t blow”. Perhaps when they see these projects in operation, they’ll stop misleading the public. Or is that a naive hope? So what do renewable energy experts think about the solar thermal announcement? The Aurora solar power plant in Port Augusta represents a significant development in South Australia’s transition to renewable power production and its pursuit for improved energy security. – Professor Samantha Hepburn – research director of the law school at Deakin University in Melbourne and Director of the Centre for Energy and Natural Resource Law (CENRL). This project, like all large projects in the ~5 GW global CSP market, are critically important in helping CSP to ‘come down the cost curve’ and allowing CSP to take up a role in the wide range of technologies that needed for around-the-clock fossil-free power for Australia any anywhere else where the sun shines brightly! – Dr John Pye – Senior Lecturer in the Solar Thermal Group at the Australian National University. An excellent decision! 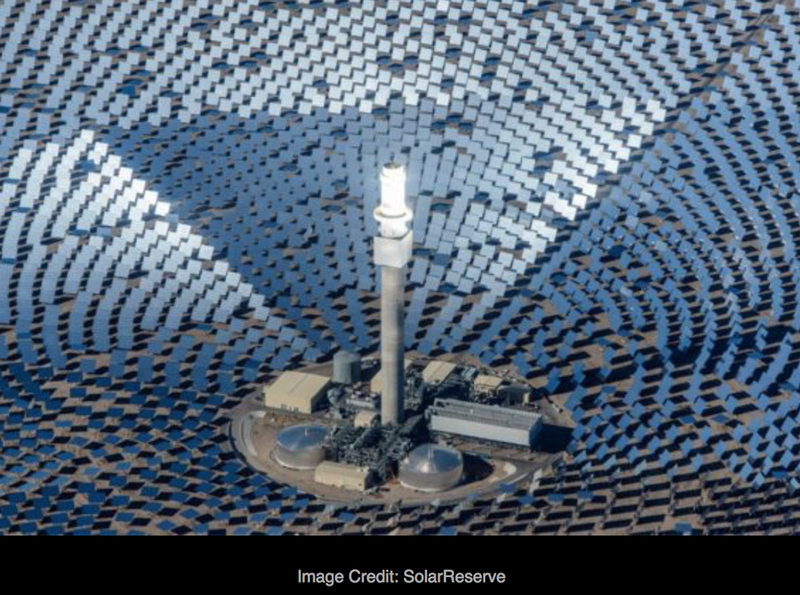 Port Augusta’s concentrated solar thermal power station with thermal storage will be a dispatchable source of renewable power. In orther words, it will supply power on demand. Along with the Tesla battery and open-cycle gas turbines, it will balance the fluctuations of the variable renewable energy sources, wind and solar PV. – Dr Mark Diesendorf – Associate Professor and Deputy Director of the Institute of Environmental Studies, UNSW Australia. While this particular project appears to be uneconomic without the state government subsidy, de-risking early stage investment is the government’s role and as more deployment of new technologies will bring the cost down as industry learns how to manufacture and deploy at scale. we need the most diverse mix of technologies possible if we are to ensure we limit climate change based temperature rises to 2 degrees if not 1.5 degrees. – Dr Ariel Liebman – Deputy Director for Monash Energy Materials and Systems Institute (MEMSI), at Monash University. The reported contract price to the state government of $78 per MWh is not much higher than recent contract wind generation prices and at or below prices for electricity from current solar photovoltaic power stations, neither of which include energy storage. It is also well below the estimated cost of any new coal fired power station in Australia, and well below the spot wholesale price of electricity in the SA market region, which has averaged between $110 and $120 per MWh since March this year. – Honorary Associate Professor Hugh Saddler – Research Associate at the Centre for Climate Economy and Policy, at The Australian National University. We have lots to learn about how solar thermal can contribute to a stable, low cost, low emission electrical system, and the announced system will be an important step in understanding the potential of solar thermal. – Dr Matthew Stocks – Research Fellow in the Research School of Engineering at The Australian National University. This is first large scale application of solar thermal generation in Australia which has been operating successfully in Europe, USA and Africa. The significance of solar thermal generation lies in its ability to provide energy virtually on demand through the use of thermal energy storage to store heat for running the power turbines. – Wasim Saman – Professor of Sustainable Energy Engineering at the University of South Australia. For the full text of these expert comments, go to the Science Media Centre collated responses. It seems we are finally reaching a tipping point. Every few weeks there is an announcement of a new solar farm, even in Queensland, the heart of Australian coal country. You can track these solar farm announcements on the RenewEconomy site and also read commentary on the community-based SolarCitizens site. This entry was posted in Activism, Climate change, Economics, Environment, Renewable Energy, Technology and tagged 350.org, activism, AYCC, climate change, coal, economics, environment, politics, renewable energy, Repower Port Augusta, solar power, sustainability by Brian Loffler. Bookmark the permalink.